There's something compelling about gymnastics. Maybe it's the potential danger? The thrill of flying through the air? I tried my hand at gymnastics as a kid; I did many a cartwheel and could even walk on my hands, but that's about the extent of it. I had two middle school friends who took gymnastics classes after school, and one day they said they'd teach me how to do a penny drop, but that ended with a head injury, so that was the end of my road to the Olympics. Maybe that's why I so admire today's female Olympic gymnasts and have enjoyed watching them this year. Back in the day, it was thought that watching female Olympians would be boring. According to Wikipedia, Women began competing in the Olympics in 1900, just four years after the first modern day Olympics was held. (They only played golf and tennis.) They had to wait until 1928 to compete in gymnastics. 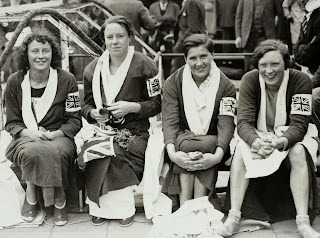 These British swimmers from the 1928 Olympics look like a fun bunch, don't they? You may have seen this awesome video from MTV; it shows the low expectations held for female gymnasts in the 1950's along side today's, and it makes me proud of how far we've come, though I also found it amusing.